A song to play while reading about the Reds: “Here Comes the Sun,” by The Beatles because there’s finally reason for optimism about this team. While some contenders with more resources largely sat idle this winter, the Reds went for it — if by “it” you mean respectability. Cincinnati is coming off five consecutive losing seasons, including four straight with fewer than 70 wins. As the losses have piled up, attendance has steadily declined from a high of nearly 2.5 million during the team’s most recent playoff season in 2013 to 1.6 million last year, the franchise’s lowest mark since 1984. The accepted wisdom for a team in the Reds’ position would have been to stay patient this winter and wait for their farm system to bear fruit at the major league level. Instead, they tapped into some of their minor league depth in a series of trades to get better immediately. The highest-profile move was a deal with the Dodgers for Yasiel Puig, Matt Kemp, Alex Wood and Kyle Farmer in exchange for two prospects and Homer Bailey’s contract. (The Dodgers promptly released Bailey, one of the worst pitchers in the majors in 2018 when healthy.) Pitchers Tanner Roark and Sonny Gray were acquired in separate trades with the Nationals and Yankees. The clear headliner is Puig, who brings his power bat from pitcher-friendly Dodger Stadium to notoriously homer-happy Great American Ball Park. In addition to the offensive boost he’ll provide, the charismatic Puig has quickly embraced his new surroundings and gives the Reds a jolt of excitement. Personally, I’m not sure whether I’m more excited for him and Joey Votto to be in the same lineup or for their buddy comedy potential. The key to the offseason, however, was the fulfillment of CEO Bob Castellini’s promise to “get the pitching.” At their peak during a run of three playoff appearances in the first four years of the decade, the 2012 Reds won 97 games while allowing the fewest runs in the NL — all while playing half their games in GABP. A 2019 rotation of Gray, Wood, Roark, Luis Castillo and Anthony DeSclafani isn’t on par with that group, but it’s a welcome improvement from the sub-replacement level staff and rookie-dominated rotations of the more recent past. The rebuild isn’t over yet, but at least Reds fans have a more competitive and entertaining team to watch while waiting for the future to arrive. What is the Reds’ most recent accomplishment? 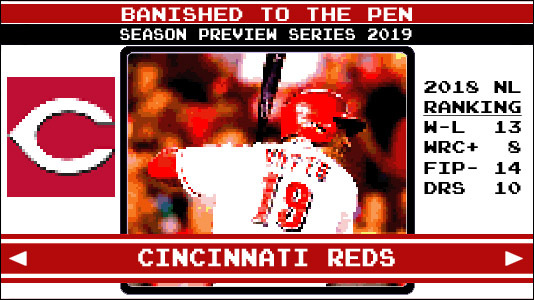 The new acquisitions, the pending arrival of Senzel, and Votto continuing to do and say Votto things made the Reds interesting enough that the Effectively Wild community — both the podcast hosts and members of the Facebook group — actually uttered the team’s name. Several times. How do the Reds define success in 2019? Top to bottom, the National League Central is the toughest division in baseball, so making the playoffs is a stretch. Given all the offseason moves, though, ending the streak of losing seasons feels like a must for this team. Meet your next two-way star. OK, Lorenzen isn’t Shohei Ohtani. He threw 81 perfectly adequate innings in 2018, mostly in relief. Lorenzen distinguishes himself from other middle relievers at the plate, where he hit .290/.333/.710 with 4 HRs in just 34 plate appearances. According to Baseball Reference’s version of WAR, Lorenzen provided more value to the Reds on offense in that small sample (0.7 bWAR) than Billy Hamilton did in 556 plate appearances (0.3 bWAR). The Reds are trying to find more opportunities for Lorenzen to hit. In one Spring Training game, he pitched an inning of relief before batting and moving to center field, a position he played in college at Cal State Fullerton. And if that’s not Effectively Wild enough for you, look at the man’s biceps. He’s Popeye. Throughout the season, the Reds will celebrate the 150th anniversary of the first professional baseball team, the 1869 Cincinnati Red Stockings. The festivities get started May 4, a century and a half to the day since the Red Stockings beat the Great Westerns of Cincinnati 45-9 in their debut. Before the latest version of the Reds plays the Giants, the team will dedicate the 1869 Pavilion near the Reds Hall of Fame. The first 20,000 fans in attendance will get a Mr. Redlegs bobblehead, and the players will wear the first of 15 throwback uniforms for the game.